The ADVENTure of Christmas is a guide for moms concerned that their children are losing sight of Jesus in the midst of the distractions the holiday season brings. 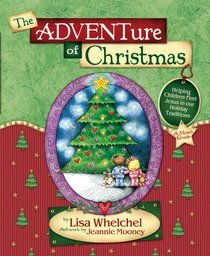 Lisa Whelchel was such a mum, but instead of abandoning the traditions of Christmas she rediscovered their original meanings, which were intended to remind people of God's unfathomable gift. Hanging lights on the house, wrapping gifts, and decorating the tree have become opportunities to teach her children about how they relate to Jesus' birth. With The ADVENTure of Christmas, mothers can redeem what's been lost from the very symbols that are gentle reminders of the true meaning of Christmas. About "The Adventure of Christmas"
Mooney has the opportunity to combine her love for art & writing into onecompany, producing sterling silver jewelry, tin Christmas ornaments, paper based jewelry, frames, and bookmarks, all trademarked by her colorful, whimsical style and heartfelt verses.